Today’s planning issues don’t respect boundaries. Rising tides don’t stop at the county line. Transit systems roll from city to city. Jobs and housing are joined at the hip. Public health touches everything. Emerging Trends in Regional Planning finds common ground for planners without borders. 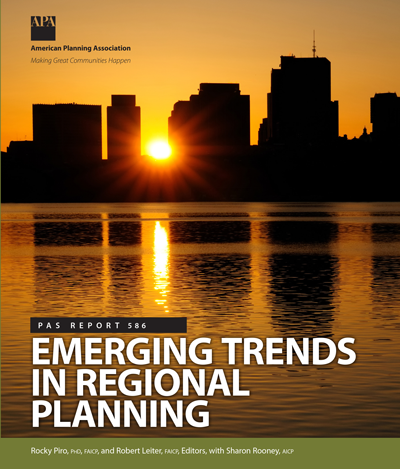 In this panoramic PAS Report, the best thinking of APA’s Regional and Intergovernmental Planning Division comes together under editors Rocky Piro, PhD, FAICP; and Robert Leiter, FAICP. The report lays out six trends that are making regional planning more integrated — and more focused on sustainability across the board. Chapters look at regional takes on the evergreen topics of water and land resources, economic development, and housing. The discussion also covers the emerging areas of climate change and public health. Readers will discover fresh ways to put plans into action, in sections on collaboration, funding, and more. Real-world examples show regional planning at work from Seattle to San Francisco and Denver to Dallas. An eight-point agenda drawn from APA’s Sustaining Places initiative gives new regional plans a solid place to start. The questions planners face are boundless. For answers, you’re going to need a bigger plan. Emerging Trends in Regional Planning is a must-read for everyone who wants to think globally, plan regionally, and act locally. Rocky Piro, PhD, FAICP, is executive director of the Colorado Center for Sustainable Urbanism and associate professor at the University of Colorado Denver. He is past chair of the Regional and Intergovernmental Planning Division of the American Planning Association (APA) and is on the board of directors of the International Urban Planning and Environment Association. He served as manager of Denver’s Department of Planning and Community Development, program manager in the Growth Management Department of the Puget Sound Regional Council, and chair of the Shoreline Planning Commission in Washington. Robert A. Leiter, FAICP, is a lecturer in the Urban Studies and Planning Program at the University of California San Diego. He previously served as planning director in four California cities from 1978 to 2003. From 2003 to 2009, he served as director of land use and transportation planning for the San Diego Association of Governments, the regional planning agency for San Diego County and its 18 cities. He has served on the board of APA’s Regional and Intergovernmental Planning Division for over ten years, including four years as board chair.